Forthright and pure, with abundant finesse and freshness. Floral notes, white peach and citrus. Mineral with fresh salinity. 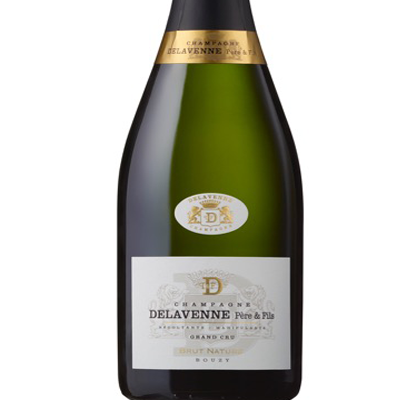 Champagne Delavenne Grand Cru Brut Nature is produced without added sugar, the pure expression of our terroir in Bouzy. This is a single village cuvée blended 80% from 2012 harvest and 20% from 2011, from plots planted midway up the slopes of our Bouzy vineyards. 60% Pinot Noir and 40% Chardonnay. We employ neither malolactic fermentation nor Cold Stabilization, and our winemaking is done in Stainless Steel tanks using only indigenous yeasts. These are the choices we make to preserve the purity of the aromas and flavors that the grapes and the Bouzy terroir have to offer, and allow each champagne to fully express its quintessential personality. In addition, this Brut Nature has spent five to six years on the lees, with late disgorgement. The Bouzy terroir, south facing hillsides in the Montagne de Reims is made up of sun-soaked chalk soils, bordered by forest and caressed by cool evening winds providing natural thermal regulation for optimal growing conditions. Conscious about preserving the quality of our land for future generations, we opt for integrated agriculture, moving toward organic growing practices whenever possible.